When it comes to air compressors, bigger usually is better. Now, that’s not to say that air compressors with smaller tanks aren’t useful, but there are a lot more benefits when it comes to using a larger tank. Tool Tally’s guide is designed to help you get the best 60 gallon air compressor for you investment. Air compressors with big tanks are great for both small commercial businesses, as well as the hobbyist. A bigger tank ensures that the compressor cycles less, which not only reduces its energy consumption but also limits the wear and tear on the machine. Furthermore, larger compressors provide more power, as well as better and consistent air flow. A good rule of thumb to use when shopping for air compressors is to make sure that the tank has at least 2 gallons of storage for every CFM needed by the hand tools that you plan on using. For example, since an impact wrench usually needs about 7.5 CFM, you’re going to want a tank that has no less than a 15-gallon storage tank. Bigger storage tanks also mean that you can operate multiple air tools at the same time, which translates to increased productivity on site. 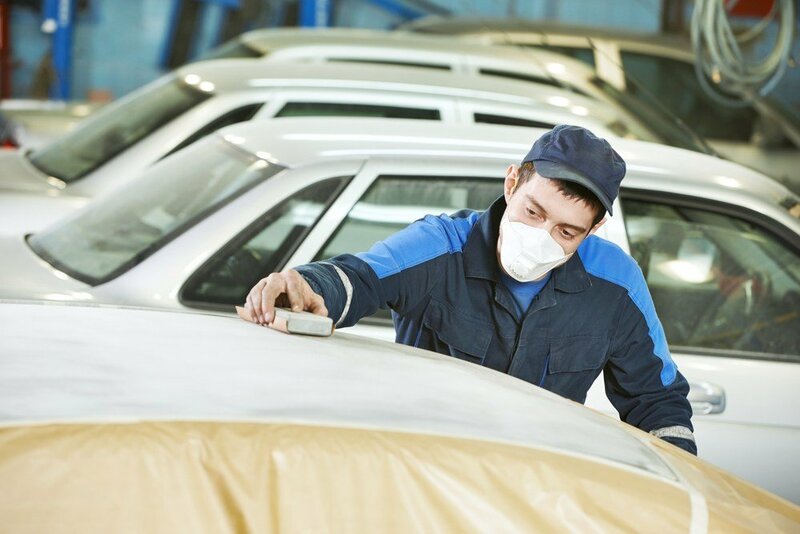 And for tasks such as sandblasting or spray painting, a large tank is essential to ensure that the compressor can provide consistent airflow throughout the entire job. Most of these 60gallon tanks only come in 230volt (sometimes called 240v). If you hunt around, you can find 2 horsepower compressors with 60gallon tanks that just need 120v. The challenge with these smaller motors is that they run continuously with heavy use and overheat. For occasional use, they can be nice for the long pauses of silence between recharges. Most 60Gallon shoppers need a tank that can handle sanding and spraying and multiple tools at once. If that is the case, it is worthwhile to spend more for the 230volt. 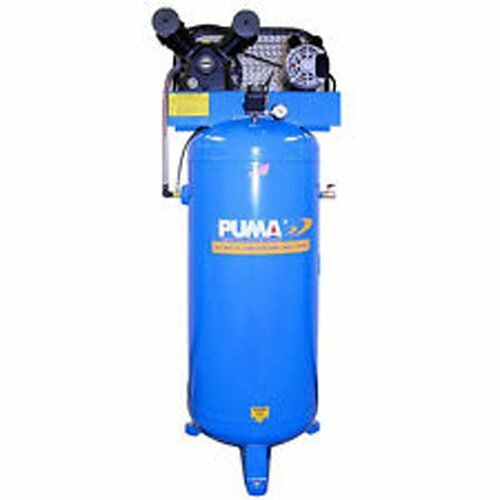 If you need a robust air compressor for home use, a 30 Gallon portable air compressor is a popular category that may be all that you need. But if you never want to risk being without enough power, the 60 Gallon is where it is at. This powerful 60-gallon air compressor from Dewalt is designed explicitly for heavy-duty professional use, which means that it can handle almost anything you can throw at it. It is a two-stage, oil lubed compressor and features a heavy-duty 5HP motors, with thermal overload protection, which protects the motor from high-voltage fluctuations. On top of its patented pump and piston design, which allows the machine to run at cooler temperatures and still maintain consistent compression, the DXCMV5076055 also has a maximum PSI of 175 and is designed to operate a large variety of air tools. It can even produce 13.5 CFM at the full 175 PSI, making this an ideal choice for high volume tasks such as Paint spraying and sandblasting. Furthermore, for improved cooling and an overall lower pump RPM, the Dewalt DXCMV5076055 also features a cast-iron flywheel and large, deep-grove cooling fins. This means the compressor is designed for heavy-duty and continuous usage throughout a full-days’ worth of work, without being susceptible to overheating. This is our top-rated pick, but it is also one of the most expensive. If you need an air compressor for home use, then it might be a lot of overkill. This compressor features a solid cast iron design, which means it was built with tough in mind. It also features a long-lasting pump, which was engineered to run for more than 15,000 hours. Aside from its sturdy exterior design, this 5 HP, two-stage air compressor has a maximum operating pressure of 175 PSI, and a 60 ASME holding tank, which provides the much-needed punch when using tools with higher airflow requirements. This compressor was also designed to make cleaning and servicing as simple as possible. The individually cast cylinders, single-piece connecting rod, and overhung crankshaft make regular maintenance and service jobs easier and simpler than on other similar air compressors. This unit uses all-season synthetic lubricants, which increase efficiency, and mean that this compressor is excellent for use in hot or cold weather. Lastly, the 2340L5 is designed to run for up to 2,000 hours between regular maintenance checks. This is about four times longer than most other units that use petroleum-based lubricants. This is one of the best pumps for folks looking for a commercial-level piece of equipment that will last a lifetime. 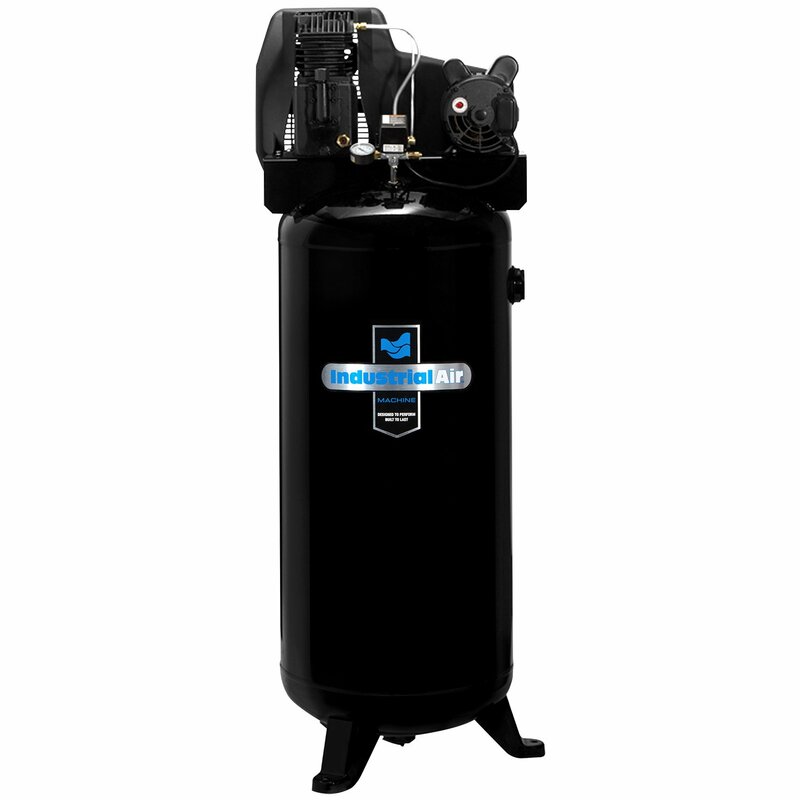 Next, on our list, we have the Maxair C5160V1, which features a 60gallon vertical compressor holding tank, a 5 HP motor, and an extended oil drain at the base to make it easier to access. The unit has a CFM rating 18.5 CFMs at 100 PSI. 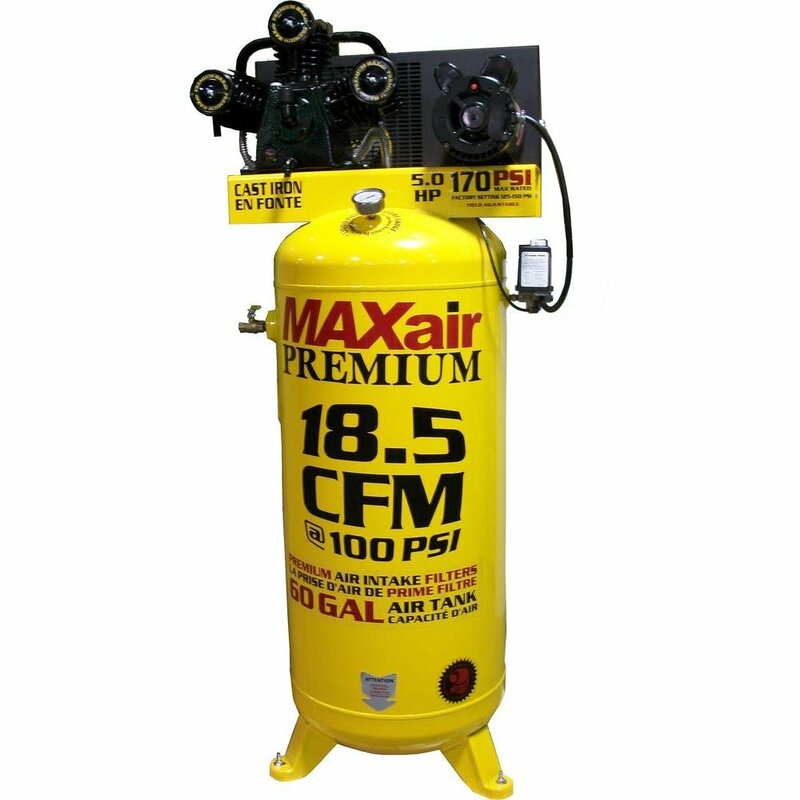 Not only did Maxair design this compressor to provide continuous high-pressure airflow, they also built it to last with its heavy-duty belt guard, cast iron cylinders, and an overall improved high-performance design. The C5160V1 is a single stage air compressor and has a heavy-duty pressure switch, designed to let you easily adjust your cut-in and cut-off limits. This unit even has an easy-view oil gauge, so you can quickly check your oil levels. And, as we already mentioned, the group has an extended oil drain, to make accessing and changing the oil as simply as possible. One final special feature of the C5160V1 is that it has an easy-to-use outlet regulator and quick connectors, so you can quickly and easily adjust output levels and switch out the tools you’re using. This is another great shop compressor for the dedicated Craftsman. 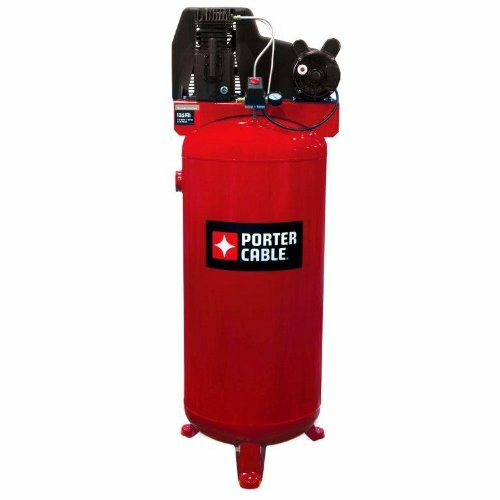 Backed by the Porter Cable name and a 3-year warranty, this is one of those Compressors that should rank highly on any shopper’s list. This is a single stage compressor with a little more than 3 horsepowers of output and requires a 230 v electrical supply. It’s an excellent single phase 60gallon compressor with dual stage cast iron twin cylinders. I’d put this one and the Ingersoll Rand that I review below in about the same category. This compressor is overkill for most homeowners (ideal for the homeowner who craves a tiny bit of overkill) and could easily handle a woodworking shop of 4 to 6 guys. One of my favorite things is how much air volume this “little” compressor can crank out. You can get 13.4 CFM at 40 PSI or 11.5 CFM at 90 PSI. This is enough to handle a sandblaster or spray gun. The max PSI is 135. This is one of the best units for a luxury private garage or a small business startup. If you can spend a little more, look at the Ingersoll Ran SS3L3. This one is splash lubricated and ships prefilled with synthetic oil. Belt driven and seems to require replacement belts rarely. 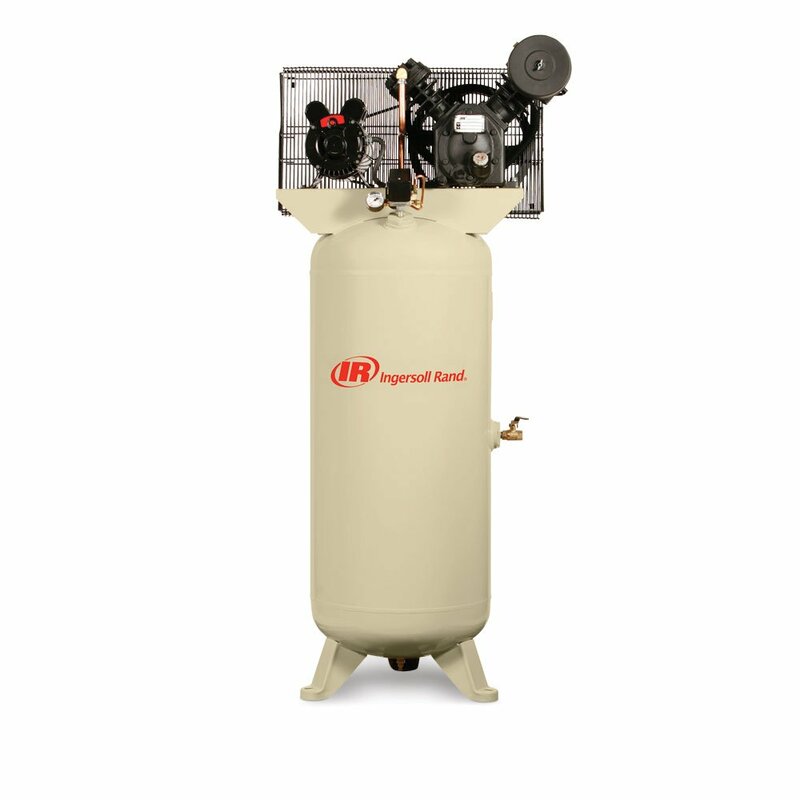 The Ingersoll Rand is an excellent look at a medium-level compressor that is over-engineered for 100% continuous use. The 3 Horsepower Single Stage motor is lighter than some of the competitors. By leveraging the 230 Volt circuit, Ingersoll Rand can create a system that will handle just about any air flow demands your shop needs without overheating or stressing the system. This is a belt drive system, but, like the rest of the compressor, it has been well-designed with a stronger belt than most of the competitor’s belt drives. It is unlikely you’ll run into any issues with this belt. This system has a max of 135 PSI And 10.3 CFM. If you drop the pressure to 90 PSI, the CFM can go up to 11.4 CFM. This system is designed to run for 2000 hours between servicing. More economical than the Dewalt, this one is going to be the ideal for a shop that needs to run multiple grinders, sander and nail guns. Just keep in mind that you may need an electrician to run a 220v plugin for you. From Puma Industries, we have the PK-6060V. 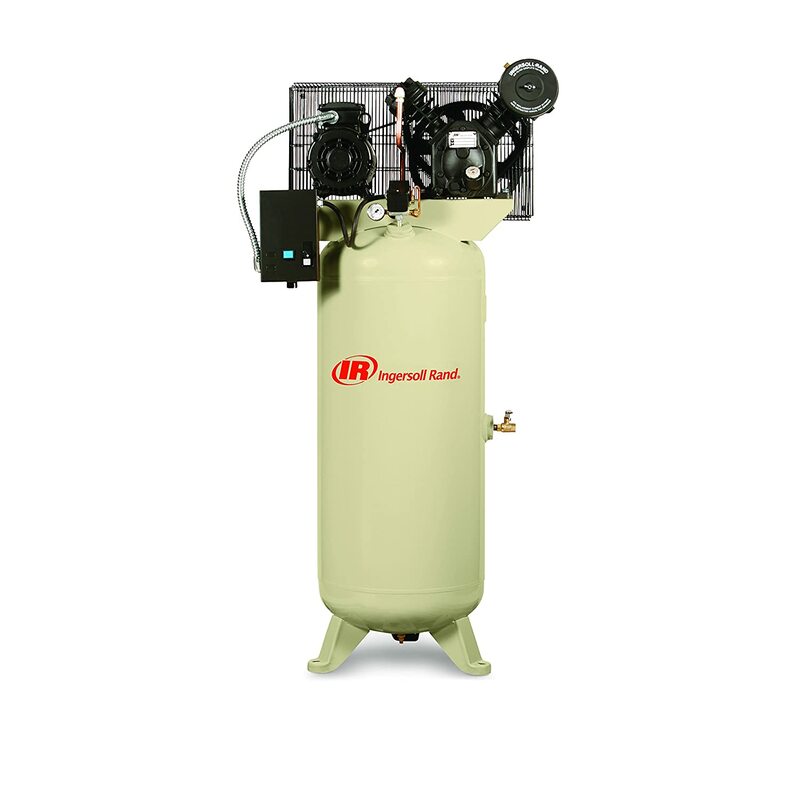 It’s a 3 HP, 60gallon hiflo single stage cast iron, oil-lubricated air compressor, and features a reliable, cast iron air compressor pump and max output pressures of 135 PSI. With its vertical tank, this 230V single-phase air compressor is a more portable unit than other units, and it’s super easy to connect your tools to it with its ½” outlet valve and ¼” drain valve. The PK-6060V uses powerful single-stage induction motors, with overload protection, to compress air, and deliver it when you need it most. This unit is an excellent compressor; however, it just doesn’t supply nearly as much pressure as some of the other compressors on our list. Our final review is the more power 240V Industrial Air compressor, with heavy-duty induction motors, as well as a solid cast iron twin cylinder air compressor complete with stainless steel read valves. Industrial Air designs their products for tough, heavy duty use either in the shop, on the farm, or out on the construction site. Therefore, their electric air compressor features many heavy-duty components, which ensures that it can handle practically any job that you can throw at it. The unit also features an oil-lubricated pump, with twin cylinders, one with a single-piece cast iron crankcase, the other with a 12-inch crankcase. Its powerful 240V induction motors provide pressures of up to 155 PSI for optimal tool performance for whatever you’re tackling. This compressor is also equipped with a pressure gauge, on/off switch, and runs on synthetic oil to ensure high-performance and a long-lasting lifespan. The ASME air receiver allows for maximum airflow, but that ASME receiver is pretty standard on most of these. The motor is splash lubricated, and I think you need to fill it up before you begin using it. Essentially, air compressors work in a two-fold process, where the air pressure in the tank rises, but the volume drops. Typically, this is achieved by using a reciprocating piston and although there are other types of compressors, this type of compressor is the most common type you’ll see on the market. All reciprocating air compressors use the following parts: crankshaft, connecting rod, cylinder, piston, and valve head. For the most part, air compressors are powered by either electric or gas motors. On one end of the cylinder, there is an inlet, and a discharge valve, which appears on opposite sides of the cylinder head. The inlet valve works by sucking air into the cylinder, which is then released into the holding tank through the discharge valve. There are also other models of air compressors, which work by using a set of rotating impellers. 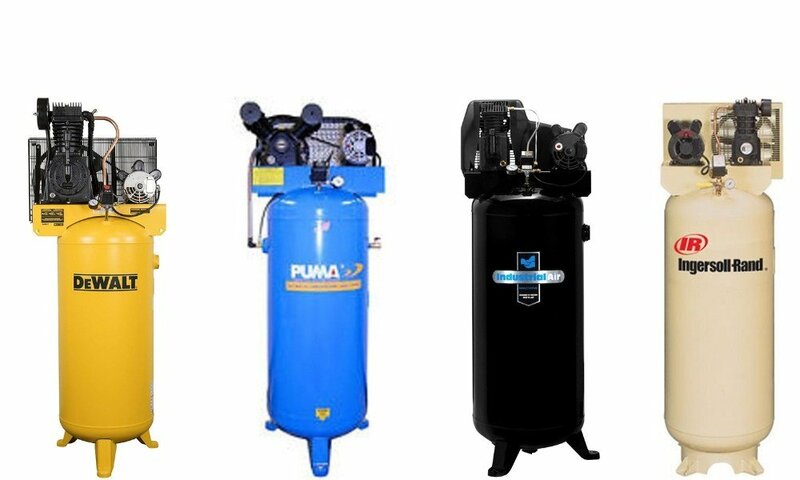 Although there are smaller air compressors that don’t use a holding tank, most air compressors, especially those used in workshops and on construction sites, will have a storage tank for holding compressed air. The compressed air can then be used to power pneumatic tools as needed. As the air in the tank is used up by the tool, the compressor’s motor will eventually start up intermittently to keep the air pressure at a certain level inside the tank. What are the average airflow requirements for the most common air tools? Air compressors are usually rated in two ways: PSI, or pounds per square inch, and CFM, or deliverable cubic feet per minute. These two measurements are the numbers used to determine the effectiveness of a compressor for different situations. Therefore, to correctly choose an air compressor to meet your needs, you’ll first need to determine the PSI and CFM requirements of the air tools you plan on using. Keep in mind that if you’re only planning on using one tool at a time, you’ll want to look for the device that has the highest PSI/CFM requirements to ensure your compressor can keep up. On the other hand, if you plan on using multiple tools at the same time, then you’ll want to add up the total CFM requirements of each hand tool. Below, we’ve put together a chart with some of the most common air powered tools and their CFM requirements. I also have an air compressor sizing guide that has even more tool air flow requirements. There are mainly 3 different types of air compressors: reciprocating compressors, rotary compressors, and scroll compressors. Reciprocating compressors are the most common type of compressor you’ll find on the market. They use pistons, which are driven by a crankshaft, to draw in air, compress it, and pump it into the holding tank to be used at your convenience. They can be driven by either gas or electric motors and typically range from 5 to 30 HP to suit a variety of different applications. Rotary compressors typically use two rotating positive-displacement screws or impellers, which naturally force the air into a small space due to their shape. This type of compressor is generally used for high-demand, continuous duty operation in commercial and industrial facilities. Finally, there are scroll compressors, which are sometimes referred to as scroll pumps. They use two interleaved spiral-shaped vanes to compress and pump lower volumes of liquids or gas. Scroll compressor vanes come in a variety of different shapes. Regardless, they operate at much quieter decibels than other types of compressors. How do I adjust my compressor’s cut-in and cut-off limits, and the tank’s PSI output? Air compressors typically have two adjustable pressure settings: the cut-in and cut-off points. These are merely the limits when the compressors know to start compressing air, and when it stops running because the tank is at capacity. To determine and set your cut-in limit, start from an empty tank and let your compressor run until it reaches the cut-off limit and stops running. Then, slowly open the bleed valve and let air gently escape. Watch the pressure gauge and wait until the compressor starts running again. Note the pressure. This is your cut-in limit. To set it, adjust the larger set screw on your pressure valve. Turning the screw clockwise to increase the cut-in limit. To adjust your cut-off limit, the process is similar, except that you’ll need to adjust the smaller set screw to the desired pressure. Just let your compressor run until it cuts off and then note that pressure. Then, turn the set screw clockwise to increase the cut-off limit (for higher pressure), or counter-clockwise to decrease the limit. Finally, you can adjust your tank’s output pressure by setting the compressor’s regulator valve, which limits the amount of air that is pumped out of the tank. To do this, just let your compressor fill, attach the tool that you wish to use, and then set the regulator valve to the desired PSI output. Turn the knob clockwise to increase output, and counter-clockwise to decrease pressure. What does Duty Cycle mean and what types are there? All air compressors are designed with a duty cycle rating. This is typically expressed as a percentage and refers to the amount of time that the compressor can run in a full-cycle, which includes both running and resting times. Today, many high-performance air compressors are built with a thermal protection feature, which automatically shuts the compressor off when it reaches a certain temperature. However, there are many compressors without this feature, and it’s up to the operator to make sure to shut the machine down before it overheats. A compressor’s duty cycle refers to the length of time that it can be operated at 100 PSI and an ambient temperature of 72 degrees. Therefore, if you’re running the compressor on either an extremely cold or scorching day, the amount of cooling time needed may vary. However, it rarely becomes noticeable except during extreme temperature changes. The difference between a single and a two-stage air compressor is the number of times the air is compressed between entering through the inlet valve and exiting through the output valve. Simply put, with a single-stage compressor, the air is only compressed once, whereas, it is compressed twice in a two-stage compressor. The difference with two-stage compressors is that before being sent into the holding tank, the air is first sent into a smaller cylinder when it is compressed once again. Both single stage and dual stage compressors have two cylinders. However, two stage compressors have one cylinder that is shorter. This allows the pressure to be raised to a higher level (such as 175 PSI). These dual stage air compressors are excellent for all-day use. Another critical factor to consider when shopping for air compressors is the size of the storage tank that you’re going to need. Air compressors work by storing compressed air in the storage tank. Due to this, the tank’s storage capacity will play a role in how well specific pneumatic tools with work with the compressor. Therefore, a bigger tank is usually more beneficial, since once it’s been filled, the compressor won’t have to run as often to maintain the CFMs required by the tools you’re using. 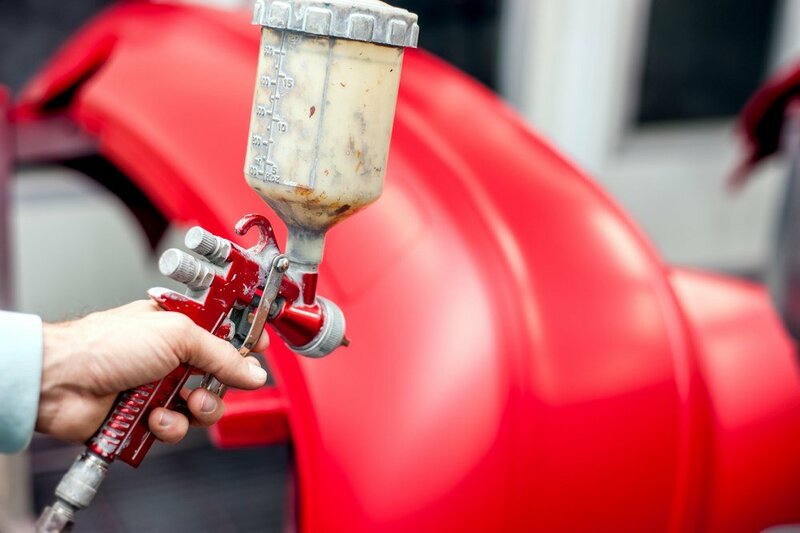 In general, if you plan on using your compressor with tools such as a paint sprayer, then you’ll probably want to consider a larger tank since these tools require a steady, consistent stream of air to function correctly. On the other hand, if you’ll be using tools that only require intermittent bursts of air, such as a nailer or grease gun, then your compressor will still work fine even if it has a smaller tank. Just make sure that you have a tank large enough to produce the required CFMs of whatever tools you plan on using. For more on airflow requirements, see our guide on sizing your air compressor. It’s also important to decide whether you’re going to want a vertical or horizontal storage tank. The tank’s orientation will not affect its performance. However, it will influence the amount of floor space needed to store your unit, as well as how portable it will be. In general, you’ll find air compressors rated in terms of “CFM” and “PSI” rating. CFM stands for cubic feet per minute and is the amount of air that the compressor draws in per minute. Whereas, PSI stands for pressure per square inch and refers the pressure that the compressor can output its air. The higher the CFM rating on an air compressor, the more powerful the machine will be and the faster it will be able to draw in and then output air. However, a compressor’s CFM rating will vary depending on what the unit’s PSI rating is. Another meaningful way that compressors are rated is by the size of its storage tank. This number is usually referred to in gallons or liters and describes the volume of compressed air that the container can hold. Larger tanks aren’t only capable of holding more air. They’re also better at keeping the air compressed at higher pressures. Finally, air compressors are also rated in terms of horsepower. This refers to the power output of the motor that runs the compressor. Most air compressors range between 5 to 30 HP, but there are air compressors used in heavy-duty applications which run in the hundreds of horsepower. Just keep in mind that horsepower will not necessarily affect a compressors air flow, and many smaller motors are still capable of outputting large volumes of air at high pressures. Today, air compressors come with either oil-lubricated or oil-free pumps. Oil-lubricated pumps require the oil to be checked and changed on a regular basis, whereas oil-free machines do not require this type of maintenance. Just like any other machine, proper lubrication ensures that everything functions properly and doesn’t wear out as fast. This means that oil-lubed compressors usually have a more extended lifespan, which is why they are the more popular type of compressor. Still, advancements in technology have made significant improvements to an oil-free compressor’s lifespan, and today, many are capable of providing several thousand hours of run time, which nearly compares to that of an oil-lubricated compressor. Although there are more powerful air compressors used for large commercial and industrial applications, most compressors used at home or on the job are either single phase 230V, triple-phase 222V, or 120V compressors. 230-volt motors are more powerful than 222V or 120V compressors; however, they’re usually only single-phase compressors. This means that while they can still supply large amounts of air, they’re not as good at compressing it as quickly as a dual or triple-phase compressor. On the other hand, there are also 120V compressors, which are generally smaller than 230V and 222V compressors. These units are much more portable and are perfect for smaller jobs in the garage or around the house. Generally, the more voltage a compressor needs, the more powerful it will be. While it wasn’t an easy decision, we’ve chosen the Dewalt DXCMV5076055 compressor as our top pick. This compressor with its two-stage compression, and reliable cast iron pumps, is engineered especially for robust, heavy-duty, all-day use. Lastly, we also liked the fact that this compressor is an oil-lubricated machine, as well as its extra cooling features, which mean that, as long as it’s properly maintained and serviced, this compressor should work great for whatever jobs you and your team want to tackle.